If there’s only one thing you need to know about me, it’s that I’m totally obsessed, probably addicted and very much in love with coffee. I don’t think I’ve gone a single day without a cup since I was about 15, and I don’t plan on doing that soon either. Coffee is just a great excuse to catch up, take some time out or just get out of the house. As it’s such a big thing for me, I thought I would share a few of my favourite coffee shops in Cardiff, incase you wanted to try them out too. I love this coffee shop! It’s one of my absolute faves, it’s right in the centre and a great space to work or catch up. They have loads of tables and you have the choice of sitting inside or out in the arcade. It’s also quite dimly light which makes it feel cosy and if you love the coffee you can buy a bag of beans to take home. This quirky coffee shop on Queen Street has its own roastery and is perfect if you consider yourself a real coffee connoisseur. They invited me for a blogger event over Christmas and their chai latte is particularly amazing. They use a special syrup from Jeeves & Jericho that makes it taste absolutely incredible. If you’re looking to take Instagram pictures then this is THE best place to go, as it was designed for getting likes. From the leafy wall, to the neon sign and the perfectly decorated doughnuts there are so many picture opportunities it’s unreal. Blanche is also vegan so if you have friends with different requirements it’s an easy place to go. 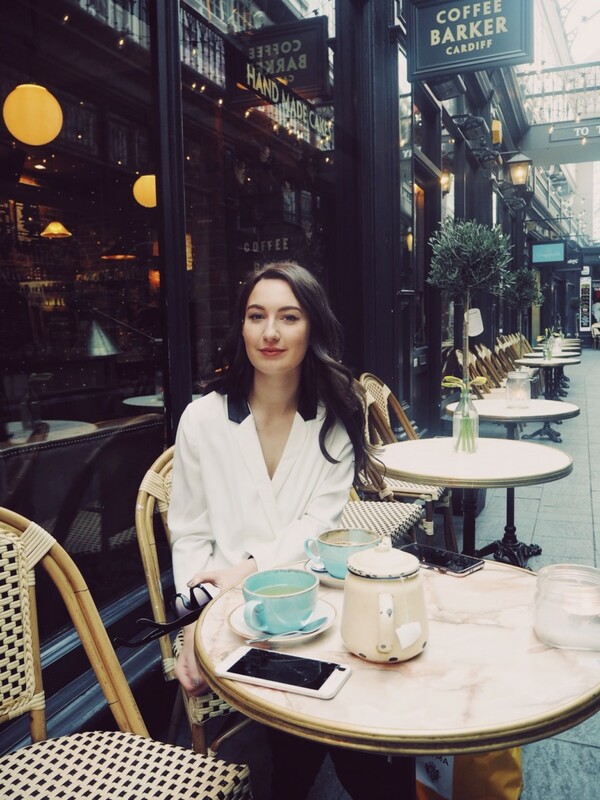 This is a favourite of all the bloggers in Cardiff because it’s so Instagrammable outside, think Parisienne vibes. They also do great coffee, fancy milkshakes and food so it covers all bases. I particularly love going for breakfast though as they do the best egg and avocado on toast. It’s also in Castle Arcade, which is stunning as it has all its original features and an upper level with cute shops. Hard Lines gives me New York vibes and it’s definitely the coolest and most hipster of all the coffee shops. They have a stall in Cardiff market which is the one I go to the most and their coffee tastes really, really good. They also do a beetroot latte which is bright pink if you wanted to push the boat out. If you don’t have time to sit in then the Handlebar Barista will be your go-to guy. This super clever coffee cart is built onto a bike so it moves around the city, which is so perfect if you commute in the morning. As a heads up he’s often outside Queen Street Station! I’m so in love with this coffee shop, it’s beautiful inside, has great food and helps to support homeless people in Cardiff. It’s also just off Queen Street, on a really quiet street so it’s nice to get away from the busyness. They do really great cakes if you have a sweet tooth and have a great breakfast and lunch menu, including vegan and gluten free options. If I’ve missed anywhere make sure to let me know in the comments, I’m always up for discovering new places. Any excuse for a coffee, right? Same! If you want to go let me know? Thank you so much <3 You're always so supportive! I absolutely love Blanche Bakery – I visit every time I am back in Cardiff. This post made me miss living there tho! I really need to go! I’ve heard so many good things and I love a pic by the neon sign haha.